Now that Amazon has released the 7-inch Kindle Oasis 2, there’s finally a larger Kindle to contend with the 7.8-inch Kobo Aura One. The size of the new Oasis is actually closer to the 6.8-inch Kobo Aura H2O, and I show it briefly at the end of the video review to give an idea of the size difference, but overall the Aura One is the more comparable model to the Kindle Oasis. Both are each company’s top of the line model, and both are similar in quality and price. They share a number of the same features. Both come with 8GB of storage space, with the option to upgrade to 32GB. Both are waterproof with an IPX8 rating, both have frontlights, 300 ppi E Ink Carta screens, Wi-Fi, auto-adjusting light sensors, and a number of similar software features. It would take too long to go over every feature but you can find full reviews and videos on the main review pages for the Kobo Aura One and Kindle Oasis. The Aura One’s software has changed some since that review was posted. It runs smoother now and the touchscreen is more accurate thanks to the latest update. Things like highlighting, zooming, and scrolling work better than they used to. However, I still have problems borrowing library ebooks through Overdrive; half the time it gives an error or shuts down and reboots. Awhile back I named the Kobo Aura One my favorite ereader of all time. I like the larger screen, the font choices, and the Overdrive integration, but it’s not perfect. I really like the added page buttons on the Kindle Oasis. For me being able to rest a thumb on a page button is more comfortable than adjusting to swipe the screen with every page turn, but I’m still not sold on the unusual tapered design. It doesn’t help make it feel lighter than the Kobo Aura One. To me they feel about the same weight in-hand, but the Aura One actually weighs 36 grams more. At this point I can’t recommend one over the other because I still need more time with the Kindle Oasis, but so far I really like the screen and frontlight a lot, and the performance is little zippier than the Aura One. I’ll update this after posting the full review. Here’s a list of the main differences between the Kindle Oasis 2 and Kobo Aura One. More software-related features are outlined in the video, but I had to edit a lot out because it was getting way too long. Design and Size – The Kindle Oasis has an unusual tapered design that goes from 3.4mm on one side to a thicker 8.3 mm on the side with the buttons where you hold it. The Aura One has a more traditional design that’s very thin but with no page buttons. The Kindle Oasis weighs 194 grams and measures 159 x 141 x 3.4-8.3 mm. The Aura One weighs 230 grams and measure 195 x 138 x 6.9 mm. Screen – The Kindle Oasis has a 7-inch E Ink Carta display and the Kobo Aura One has a 7.8-inch E Ink Carta display. Both have flush glass screens, capacitive touchscreens, and 300 ppi. Kobo ebooks have headers and footers and Kindle ebooks do not, so the area of text shown is similar in size, but the Aura One’s screen is bit wider and you can set the margins tighter to the edge to fit more text on-screen. There’s also a fullscreen patch to get rid of headers and footers (not sure if it still works), and sideloaded ePubs don’t display headers. 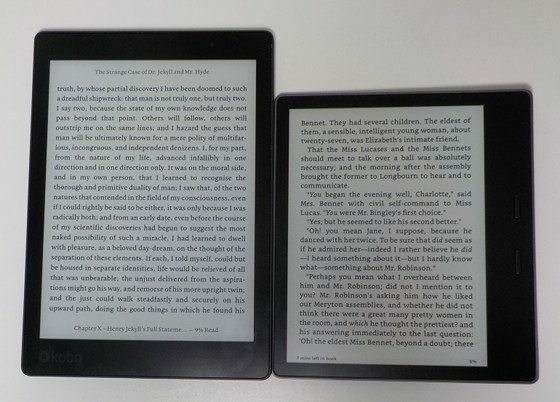 Frontlights – Both have nice frontlights but the Kindle’s is very evenly lit and it’s a touch brighter and lighter in tone at higher settings, and a little more yellow in tone at lower levels. The Kobo Aura One adds the option to change the frontlight color temperature from a cool blue to a warm orange, but the orange setting has some lighter areas on mine (frontlights vary greatly however so they’re probably all different anyway). Both have a sensor to automatically adjust the frontlight based on the amount of surrounding light. Fonts and Layout – One big advantage for Kobo is you can fine tune fonts and layout more than on Kindles. Amazon recently added some new bold setting and extra font sizes to Kindles, but Kobo still offers way more control over fonts and layout, and you can even add additional font types. OverDrive – The Kobo Aura One has OverDrive support built-in to easily download free library ebooks directly to the device without having to use a computer or other device. The Kindle Oasis supports library ebooks from Overdrive as well, but you have to use a separate device to browse and checkout the books. Patches and Apps – Kobo’s ereaders are open to adding extra features and reading apps. See the Kobo Aura One KOReader Review for a look at an alternative reading program that works well for PDFs. Kindles are capable of the same kinds of things but they have to be jailbroken first and that’s not an easy task. Audible Audiobooks – The 2nd gen Kindle Oasis adds support for listening to audiobooks from Audible by connecting Bluetooth headphones or speakers. Formats – The Kobo Aura One supports the following formats: EPUB, EPUB3, PDF, MOBI, JPEG, GIF, PNG, BMP, TIFF, TXT, HTML, RTF, CBZ, CBR. The Kindle supports these formats natively: AZW3, AZW, KFX, TXT, PDF, MOBI, PRC; and these formats through Amazon’s free conversion service: HTML, DOC, DOCX, JPEG, GIF, PNG, BMP. They’ll also convert DRM-free ePubs if you simply change the file extension to .png. Wireless – The Kindle adds the option for “free” cellular connectivity, 4G LTE in the US and 3G in other areas. It’s free in that there are no monthly fees but the initial cost is higher. The 32GB cellular Kindle Oasis sells for $349. Price – The Kobo Aura One sells for $229 in the US for the 8GB model. The recently announced 32GB will sell for $279 starting in December. The Kindle Oasis starts at $249 in the US for the 8GB model and $279 for 32GB. Just got my 2017 Oasis today, so haven’t had any time to do more than set it up, move all my books onto it, and give it a full charge. Won’t really get a chance to start using it until tomorrow. Had considered an Aura One when it was first released, but I’m pretty firmly entrenched in Amazon’s ecosystem, and didn’t want to have to worry about 3rd party programs or workarounds to get everything to work smoothly. Plus, I’ve found I really just prefer using page turn buttons over pure touchscreens. = Aura one with lowest brightness and warmest color tint next to Oasis 2, inverted colors lowest brightness, in total darkness? The better “night mode” will be the deal maker for me, and thus far no one else seems to have gotten the idea of comparing those features. If night mode is that important to you you’re better off getting the Kindle. I never thought the patch worked that great on Kobos, too much ghosting, and it looks like it doesn’t even work on the Aura One anyway unless you want to permanently invert everything. KOReader has night mode too but then you miss out on all of the Kobo features and you can’t even adjust the frontlight color setting from KOReader. Kobo’s warm tint on lowest brightness might still be better since the blue light (which messes with the melatonin levels and thus, your sleep) is filtered out. The Oasis 2 still emits blue light, even in inverted mode. That’s why I would like to see a side-by-side video in darkness on lowest brightness, to judge the amount of light emission / light quality. I firmly believe that frontlights don’t interfere with sleep at all when used at lower brightness levels. The Kindle’s light is dimmer at the lower levels but having the screen inverted doesn’t change the amount of light emitted because frontlights are above the screen. A video wouldn’t accurately show the difference because the camera automatically adjusts to low brightness levels. Yes, it surely doesn’t influence sleep much, and definitely by far not as much as light emitted from an lcd screen, but any kind of light exposure directly before / during sleep influences the cyrcadian rhythm and decreases the quality of sleep, there’s lots of research for decades. A comparison video would at least give an indication how much light a kobo on lowest setting emits vs a kindle on lowest setting & inverted. The inverted mode was included as accessibility setting for light sensitive people, so I would assume / hope it will emit less light when triggered. In my Kobo I was not able to select words and use dictionary or highlight or … in pdf’s. Also I noticed Kobo can not connect to some version of wifi’s (n/b/g). Are these completely solved in updated firmware? Kobo never improves their PDF software so nothing has changed there, and I haven’t heard anything about WiFi changes either. Love your reviews of both devices having a hard time deciding on which. I love the physical buttons on the Oasis as I’m coming from a Nook Simple Touch. The Kobo, on the other hands, appears to give you greater flexibility for file formats versus the Oasis? I have a ton of EPUBs and CBR/CBZ files and would rather NOT have to go through a long conversion process. With the info above can anyone help steer me to a well informed decision? There’s a really nifty trick to send ePubs to Kindles just by changing the file extension to .png and having Amazon convert it, but they have to be DRM-free of course. Works well but converting comic files would be a hassle. I’ll go ahead and add the supported formats to the list. This is genius! I just tried your suggestion and changed the .epub file extension to .png and used my “Send to Kindle” software, and it worked perfectly. You’ve probably mentioned this hack in the past, but somehow I missed it until now. I have the Kindle Voyage and Kobo Aura One. Still thinking about whether to upgrade my Voyage to an Oasis 2…hmmmm. How do you change .ebup file extension to .png? I have the Kobo Aura One and totally love everything about the device. I bought the Oasis 2 and read three books on it and did not enjoy the experience at all. Where the larger screen is great compared to the 6 inch Paperwhite – the all over form of the Oasis was a major fail for me. I did not like the noisy buttons at all. I did not think the all over feel of the device was comfortable. I thought I would like the inverted color option but it made the words appear fuzzy. It has been returned to Amazon and I have dug out my 2013 Paperwhite which I am enjoying way more than the Oasis even if it is the smaller screen. If Amazon had provided a 7 inch a Paperwhite I think I would have been happier. All in all I will stick to Kobo as my main book provider and Kobo Aura One as my main reader. I also have the H2O Second Edition and I think that also is a much better device than the Oasis. I wonder why these guys just don’t make a perfect one! Besides why dont you convert ePubs with Calibre? I remember that the outcome was perfect and it converts all in bulk. Didn’t like the new Oasis at all. Contrast just wasnt there and I dislike the boldness setting as it changes the font size and line spacing. Aside front that the slick back and cold feel wasn’t comfortable to hold, not to mention the noisy page turn buttons and the sharp rough edges. Another thing was it was much heavier than expected despite it being lighter than the Aura One on paper which was odd. This is perhaps due to the weight being on one side as opposed to evenly across the device. The original and exchange both were plagued with yellow uneven screens and I just finally gave up because to me it was more about the lack of contrast or uneven display but the over feel of the device. I wish manufacturers would go back to infrared screens as they are superior in clarity, sharpness and evenness of light in comparison to Capacitive touch. I am still amazed at the beautiful display of my original Kobo Aura H2O. Nothing comes close to it, not even the Aura One. I totally agree! The first gen H2O has the most beautiful display with the best contrast when using it without frontlight. The newer devices which have all capacitive technology have darker screens. Strangely a lot of people don‘t seem to bothered by that. I own a Aura One too. During the first time it was nice reading on the bigger screen, but after a few weeks I returned back to the H2O. Now since 2 month I have installed Coolreader and Koreader (the later for pdfs), and with theese two programs the Aura H2O (1st gen) is the perfect reader for me at the moment. Nothing surprising in review. One minute “my favourite reader Kobo One why” ? First off I never said the Kindle Oasis was my favorite ereader; I said I needed more time with it to determine how much I like it since I’ve been using the Aura One for over a year and the new Oasis has only been out 1 week. If you want to be a troll take it elsewhere because this is the last time I will respond. I watch a lot of ereader reviews on the the Internet and I think Nathan’s reviews are the best one can find. Thanks Nathan and I wonder if you’ve made up your mind yet which one of both ereaders you like the best. I realize now that I’ll never be able to definitively say one is the “best” or better than the other because they each have strengths and weaknesses. Kindle software has so many extra features and added abilities, and it’s so much easier to just wirelessly send documents to Kindles, and I like using page buttons much better than swiping the screen. But from a hardware perspective I like the Aura One better. It just feels better in the hand. I’m not a fan of slick, cold aluminum on ereaders. I also like Kobo’s fonts better, and the Overdrive integration is really nice (when it works right). It’s nice to have both ereaders, but which one is best depends mostly on each individual’s intended usage of the device. For example, someone with a vast Kindle library is obviously much better off sticking with a Kindle and someone with an ePub library is going to be better off with the Kobo. For anyone who ever contemplates getting a Kindle. Let me advise purchasing it through Best Buy or any physical store. Due to there being a high rate of quality control issues and defective Kindles, it’s more than liekly you will return at least one. The return process is much faster through best buy. Go to store, return device and get refunded, simple. With Amazon, you have to ship out package to Kentucky through snail mail UPS ground and then wait until Amazon receives item then wait an additional 1-2 days processing for them to issue a refund which takes your bank an additional 2-3 days processing. It’s a nightmare. I know the convenience of Amazon for shopping but nothing beats brick & Mortar stores for returns. thanks for this reply, I just ordered a Kindle Oasis 2 because I like fysical buttons too. What it’s ur personal choice for this moment? Two comments above pretty much says it all. If that’s the case then it makes zero sense to get the Aura One. The Kindles can be navigated with VoiceView, which is designed for visually impaired people. Case in point, I do not think he meant being blind as in literally, but more like, “I overlooked that comment”, = have not seen it. That said, I am still waiting with judgement till I can sample the Tolino epos in a Thalia store. Not sure wether I need a new reader, would really like an updated Voyage 2 with faster CPU, more memory, blue-tooth, waterproof but no aluminium. Bigger screen would be nice, but basically the form-factor could stay the same for me. Dislike Oasis 2 a little (asymetrical design), Kobo is no choice for me (dislike their Shop), and only the Tolino epos could be an alternative. Yeah, that was pretty dense on my part. 😀 I’ve got to stop writing comments first thing in the morning. OH LOL. That was not my point! I did not see ur answer up here :D. What a missunderstanding. One more question. For ebooks in pdf kobo aura one+koreader gonna be fine? It just kind of depends on the types of PDFs and what you need. For me Kindles still have the edge for PDFs but others might disagree. Kindles are better if you need notes and highlights export. KOreader has reflow, which some prefer. Just hit the search box for the KOreader PDF review and the Kindle Oasis PDF review for a close look at both. It’s for the 1st gen model but the features are still exactly the same. I did all of it, but You use both devices so I think better to ask you. I think I gonna go for kobo because I can get it in Poland and kindle only from amazon.de and last thing is 50 euro for case. Oasis v.1 has battery in case – I can pay for this, but 50 euro for normal case… It’s not like I cant pay – I just wont. KOreader is nice to have but having to reboot to use it was annoying to me, and it gets broken whenever there’s a new software update and it has some quirks I don’t like so aside from testing it to review I didn’t use it much. Plus I’ve got other larger ereaders on hand that work better for PDFs. But I still don’t mind using a Kindle for PDFs sometimes. How do you like the Kobo Aura One so far? I have a hard time deciding whether to buy the Kindle Oasis 2 or KA1. I have Kindle Paperwhite 2 and Oasis 1 and want to buy a waterproof ereader. I’m mostly interested in quality of display and battery life. Thanks in advance. Quality of display is very good IMO. I have to say that I had only paperwhite 3 in my hands that can compare, but book covers look really nice on KA1, but I think U can find answer in reviews about that. Exepct that. I love 8″ screen and natural light – I think I won’t buy any ereader without it. Reading at night is so much comfortable. Hi, thanks for your reply. I also decided to buy thr Kobo Aura One instead of Kindle Oasis 2. I also noticed some battery drain when in sleep mode, so overnight I turn the power off on my Kobo. After your recommendation I also turned off book covers displaying on screen. I love the 8″ display and the natural light. What formats do you prefer on the Kobo? Kepub or epub? I loaded some fonts on my Kobo and noticed some of them do not display correctly in ebooks in kepub format (no problems with the same fonts in epub format). I am a linux pc user, so I use calibre to send books. I did not tried to add fonts yet. I am fine with Kobo fonts for now maybe because I barely find time to read last days. I have no problems now with battery drain. I patched my Kobo and I love this reader ever more now. I have more customisation options but also reader is really much faster than before. I just get my Oasis 2 and I try to compare it with my Kobo Aura One. I find that the screen quality of Kobo Aura One is much better than the Oasis 2. The letters are much more clearer in Kobo Aura One and the contrast is also better, and not to speak the screen size. I really regret buying the Oasis 2 as it is not much difference than a Paperwhite but just a bit larger. I just don’t know why so many reviews cannot point it out, as I can instantly see the difference when putting them side by side. I mean the contrast and clarity of the words and letters. Perhaps other people are using different font types, different font sizes, different boldness settings, different light settings—there’s about a million variables. I don’t see a noticeable difference with similar settings but I do like the Malabar font on the Kobo better than any of the fonts on the Kindle. Thanks Nathan. Just an update: in my previous posting, in the comparison actually my Kobo Aura One has been covered with a screen protector. Yesterday, I added a screen protector to the Oasis 2 and I found that the screen gives me “a better clarity” appearance. May be it is because of the screen protector that makes me have such different perceptions. Thus, I agree with you that they are of similar screen. Thanks. Interesting. I would’ve thought a screen protector would make the screen look worse. Which one are you using? Any kind of layer over the screen, be it glass or a touchscreen layer, slightly degrades the clarity of E Ink screens. Ereaders that use infrared touchscreens tend to have slightly sharper text, like on the new Nook Glowlight 3, but the indented screens tend to cast a shadow along the edge in some lighting conditions so they don’t come without some drawbacks. That being said the Kindle Voyage is regarded as having very sharp and clear text despite the glass layer. It just depends. Screens and frontlights can vary a lot, even among the same model with different production runs. that’s my fear. i went ahead and got a pw3 and then decided to order the oasis on amazon as well. I’ll keep the one i like best. so far the pw3 is awesome, but i really like reading dimly in a pitch black bedroom and I find i need the light at a minimum of 3 or 4 before the contrast is too washed out. ideally 5. but then it emits a lot of light. I wish it had inverted text like the oasis. i want a slightly bigger screen and inverted text but I don’t think I could sacrifice the clarity at all. i love the screen in all but the lowest backlight settings (unless it’s daytime). I’d almost rather have a kobo to read epubs, but so far I’ve manually edited my books and have embedded fonts and ragged edge among other things working fine on the pw3. I know Kindles have problems with pinhole issues. My Voyage has had that issue and replacements don’t seem to solve the issue. Do Kobo’s have pinhole issues at all? I know Nooks don’t (At least mine haven’t) and I was so happy about the new Nook Glowlight 3 that came out. But the KA1 seems to be the next best ereader to get if you want a bigger screen instead of the standard Kindle screens. I also have more epub books than Kindle books as well, that’s another reason why I’m really looking. All frontlights are prone to pinhole issues but it’s not a common problem. I’ve had a couple ereaders with them but most don’t have any. no joke, about 4 years ago or so i tried 4 kindles. two from bestbuy and two from amazon. all four had mutliple bright pinholes and two had weird fuzzy text. i gave up on all readers until now. my pw3 from bestbuy (first one now) has one incredibly slight pinhole on the bottom left, but it’s very hard to see if the backlight isn’t bright and at certain angles. and it’s not in the text area. so without looking for it I wouldn’t really notice it. so for me it’s a complete keeper. unless the oasis is thst much nicer…so sadly that is 100% for pinholes for me with five kindles. but I understand the issue. it is more that the backlight layer has an imperfection and the light hits the imperfection. so it’s understandable that you could smack your kindle on something and one could form. but the glass should help prevent them on the new models. at least this is my understanding. In my opinion, if we only consider the core reading experience and functionality between Oasis and Aura One – I think that the Aura One is a superior choice. I will try to give a couple of reasons why. The author has touched on it in the article, but the whole flexibility on fonts, margins and the rest is simply amazing. This allows you to tailor your reading experience to fit you just perfectly. Second, I think that the Aura One has the best screen that eBooks have ever seen. Technically speaking, the hardware on the Aura One is more advanced than the one of Oasis. If you install Koreader on Kobo, you will probably get the best PDF reading experience available today. And the last point, which everyone knows about – I can literally read almost any book format in the world on my Kobo. This alone makes the choice easy for me.